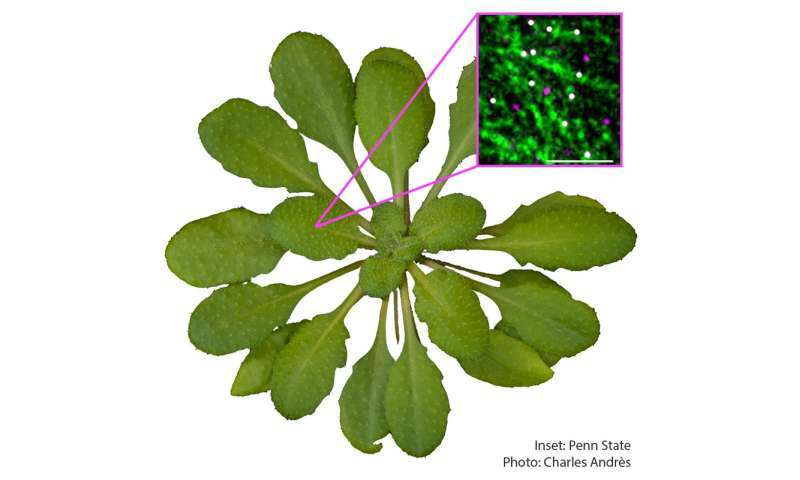 Using the model plant species Arabidopsis thaliana, also known as thale cress, a team of researchers from Penn State have identified the main proteins that prepare plants to create cellulose -- a compound used in a variety of manmade materials. The proteins cellulose synthase interactive 1 and PATROL1 associate with each other (inset) and may contribute to how quickly the cellulose synthase complex, a grouping of different proteins known to be involved in the synthesis of cellulose, reaches the location where cellulose is made. Credit: Charles Andrès; Inset Penn State. "Cellulose is the single most abundant biopolymer on earth," said Ying Gu, associate professor of biochemistry and molecular biology at Penn State and senior author of the paper. "It makes up about 95 percent of paper and 90 percent of cotton, and its derivatives are even in the emulsifiers in ice cream. In the past ten years or so, cellulose has also been considered as a major component of biofuels. Understanding how cellulose is synthesized may allow us to optimize its use as a renewable energy source." "We knew that cellulose is synthesized in the plasma membrane that surrounds plant cells within a heteromeric protein complex—a grouping of different kinds of proteins—called the cellulose synthase complex, and that the main component of this complex is a unique cargo protein called cellulose synthase," said Gu. "But we didn't know if other proteins are involved in the complex, or how the proteins get to the plasma membrane. To start answering these questions, we used a combination of approaches, including cell imaging, functional genetics, and proteomics, to create a timeline of events and to identify the main proteins involved in preparing the cell for synthesis." The researchers showed that a protein called cellulose synthase interactive 1 (CSI1) interacts with the cellulose synthase complex prior to synthesis and may help mark the site at the plasma membrane where synthesis occurs. They also demonstrated that CSI1 interacts with a separate complex called the exocyst complex, which is involved in transporting materials to the plasma membrane in a variety of species, and a protein called PATROL1. These components may contribute to how quickly the cellulose synthase complex travels to the cell's outer membrane before synthesis. "We knew that the exocyst complex is evolutionarily conserved, with essentially unchanged structure in yeast and mammals, and here we confirmed its role in plants. But PATROL1 is a plant-specific protein that is not like anything we see in mammals or yeast. We are puzzled by what PATROL1 actually does and are excited to continue to investigate its function." "We eventually hope to translate what we know about how plant cells build cellulose to more efficiently break it apart again for use in biofuels," said Gu, "ultimately increasing the efficiency of biomass-based energy production."